The world of whisky can seem strange from the outside looking in but can captivate you after your first taste. But what do you NEED to know before starting your journey? The answer to that is nothing, you will not be laughed out of Whiskyland for not knowing your Bourbons from your Highland malts but here are a few interesting facts and suggestions to get you started. Firstly let’s try and clear up some of the confusion around the spelling, some go for Whisky and some go for Whiskey and both are right. The name is derived from the Gaelic “Uisge Beatha” which means water of life and the modern spelling tends to differ geographically with the Scottish and Canadians preferring the ‘Whisky’ spelling and the Irish and Americans choosing ‘Whiskey’ and it comes from the Irish wanting to distinguish their superior product in the 19th century. Because Scotch whisky was of a poorer quality in those days the extra ‘e’ was added to make it easier to differentiate for export reasons. These days, of course, Scotch whisky is of a considerable higher standard and is highly regarded throughout the world. 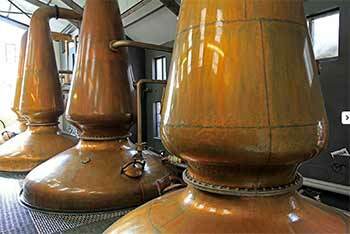 Scotch can be split into different regions for production including; Lowland, Highland, Speyside, Campbletown and Islay. Several of the world’s leading brands come from Scotland including Johnnie Walker, Bowmore, Laphroaig and Glenfiddich to name a few. For Irish Whiskey to be classed as such it has to follow the Irish Whiskey Act of 1980 which states that the product must be distilled and aged in Ireland among other rules. American Whiskey is another interesting subject that is worthy of further and full investigation. Including the famous Bourbons and Tennessee whiskies there are a lot of options to explore here too. Now there is also something about blended and single malt whisky. A blended whisky is a mixture of at least two single malt whiskies, often more. Well known blends are Chivas Regal or Black Bottle. A Single Malt Whisky is the whisky, or product, from one distillery. Whisky is big business and a huge part of successful countries export economy and is taken very seriously. Though not as famous, many countries around the world are successfully producing their own whiskies including Japan, India and Sweden. 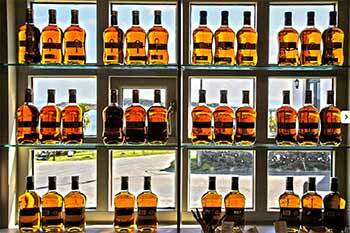 If you plan to have a taste to get the idea of what countries have to offer why not start with some of these suggestions, starting with Scotch whisky. You could try a nice Highland Malt like the unique Glen Garioch Virgin Oak described as having a “rich buttery malt, chocolate and spice” taste with notes of orange and ginger marmalade, treacle syrup and chocolate cake. Not a bad way to kick of proceedings. Or try the Classic Malts, a series of whiskies from each of the main whisky regions in Scotland. They are Dalwhinnie, Talisker, Cragganmore, Oban, Lagavulin and Glenkinchie. From Ireland the Jameson Select Reserve is a rich fruity blend with notes of peach and coconut. A nice way to start your journey into Irish whiskey. With American Whiskey you can opt for the famous Tennessee whiskey Jack Daniels or look at some of the bourbons like Makers Mark or Wild Turkey there is a great choice here too. As for global whiskies you can find tasting sets that contain several different drams from around the globe. These are great ways to explore which whiskies best suit your palate without the expense of purchasing large quantities. It is a very interesting topic when you get started and the history and work that goes into getting that right blend bottled is a far more difficult task than you might have imagined.